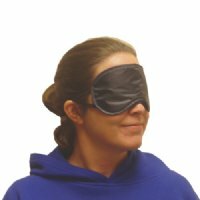 MRI Safe eyeshade sleep mask. Made from satin soft polyester, this is the same mask provided by major airlines and hotels. Available in Dark Blue Only (inside is black). 2 elastic Straps.